Espionage fact and fiction collide in this thrilling compendium of spy writing, where some of the greatest spy stories ever told meet the genuine agent records and instructions that altered history. Ian Fleming’s genre-defining genius and John le Carré’s iconic George Smiley are interspersed with real-life stories of derring-do inside Bolshevik Russia. Literary classics by Graham Greene and Somerset Maugham appear next to never-before-published reports from two of the Cambridge spies. Fully updated with tales of agent-running from the first female Director-General of MI5, Dame Stella Rimington, and Andy McNab’s chilling account of a top-secret mission deep inside IRA territory, this compelling anthology is proof that truth really can be stranger than fiction. With expert commentary, former intelligence officer Michael Smith takes us on a fascinating journey inside the mysterious world of British intelligence. 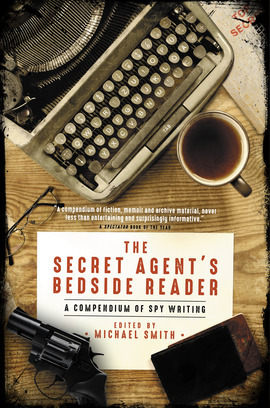 The Secret Agent’s Bedside Reader is a must-read for every espionage enthusiast and aspiring agent. Spectator Book of the Year: A compendium of fiction, memoir and archive material, never less than entertaining and surprisingly informative. If you crave armchair action and adventure this well-chosen anthology should prove thoroughly satisfying.